VATICAN CITY (CNS) — Though not as fast as a speeding bullet, “Superpope” will fly across the world, gathering autographs of sports stars and eventually being auctioned off to raise money for the pope’s charity. The first “Superpope” image went up on a backstreet near the Vatican on a cold night in January 2014. The artist, Mauro Pallotta, who signs his work, “Maupal,” paints his removable street art onto paper that he then glues with a water-based adhesive to walls around Rome. While most of his street art tends to stay up for years, the depiction of the pope drew an uncharacteristically quick response from the city’s “decorum” police, who showed up just two days later to inspect the infraction and then had it scraped off and repainted the next day. Pallotta, a classically trained painter, put up another pope-themed piece near the Vatican in October 2016, this time depicting a clandestine graffiti game of tic-tac-toe. In the rendition, Pope Francis has climbed a ladder to turn the O’s into peace signs and makes the win while a Swiss Guard peeks around the corner as the lookout. That piece only lasted half a day before the city’s waste collectors scraped it all off. 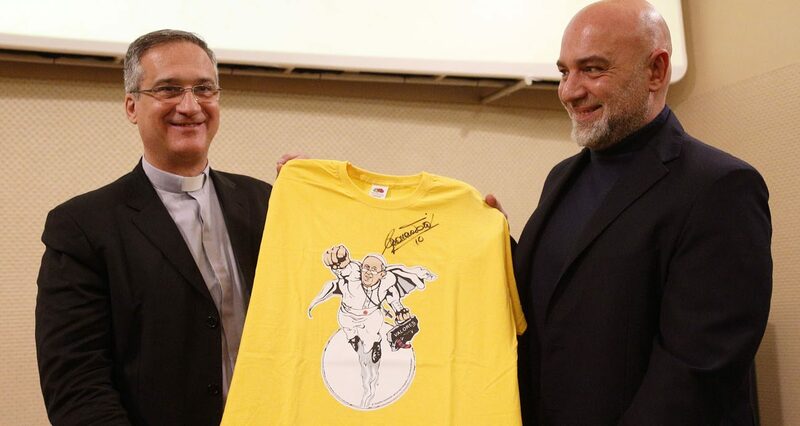 But once Pallotta got permission from the Vatican to use his “Superpope” image, the artist launched an #OrdinaryHeroes movement online in October 2017 with the help of a local entrepreneur. The idea was to get people to share stories of ordinary people doing simple, positive and caring things, based on the belief that, “in order to change the world, we don’t need superheroes, but everyday heroes who spread the values of humility and solidarity, which Pope Francis, the first of the #OrdinaryHeroes, perfectly embodies,” according to the superpope.it website. Pallotta told reporters Feb. 8 that he was “enormously happy and proud” about the latest initiative and that the message behind his work was finally understood. The superpope.it site sells T-shirts with the “Superpope” image for 19 euros (about $23) so people can show their support for the message and show solidarity with others since part of the profit (about one euro per shirt) goes to the papal Peter’s Pence charity. But the full 100 percent of the proceeds from the autographed T-shirt sold at auction will go to Peter’s Pence, a collection that primarily funds the Roman Curia, but earmarks about 10-15 percent of fund to be used by the pope for emergency relief, medical assistance to those in need and the construction of schools and hospitals in poor areas, said Archbishop Angelo Becciu, a top official in the Vatican Secretariat of State. Written on the back of the shirts are quotes from Pope Francis in Spanish, English and Italian. The shirts are also on sale in Vatican-owned bookstores by St. Peter’s Square.